On the front page of The News, Estacada Mayor Earl Eckersley encouraged a week of "intensive work to clean up our yards and homes" and "to improve the appearance of our town for the benefit of ourselves and those visiting us." The Clackamas River garbage service would pick up extra trash for free, and anything that was too large for them would be picked up by city trucks. Twenty four children had recently graduated from Mrs. Hale's kindergarten class in Estacada. Awards were given to Jeff Lyons, Julia Dierdorff, Charlene Crabtree and Cynthia Mecklenburg for "Very Good Attendance," and awards for "The Most Complete Scrapbook" were given to Chuck Ramsay, Mike Burch, Toni Sue Stearns and Charles Erlandson. Showings at the Broadway Cinema included "The Goodbye Girl," starring Marsha Mason and Richard Dreyfuss. At Horner's Food King supermarket, turkey drumsticks were 39 cents per pound, large bell peppers were four for $1 and potatoes were five pounds for $1. Cliff Gavic wrote a letter to the editor criticizing poor driving habits. "We, the drivers, have become very lax in our driving responsibilities, seeming to neglect basic rules of the road," he wrote. "Many accidents would be prevented if we, once again, would become defensive drivers, having consideration for the other, and just simply obey the driving laws. (This would free up our police force, allowing them more time to protect you and me)." 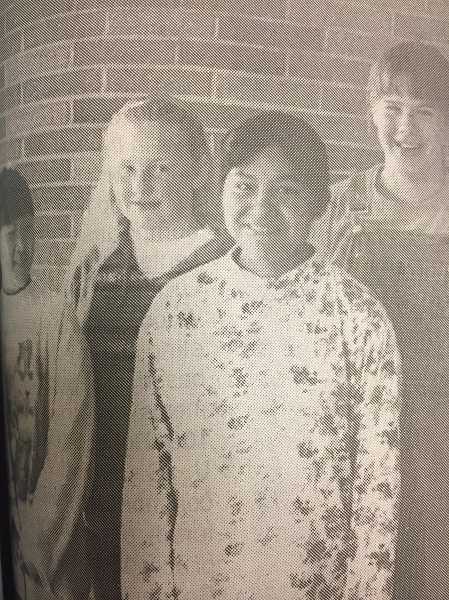 River Mill Elementary students Katie Youngberg, Tracy Larson, Marsiela Espinoza and Nicole Purdy would have artwork featured on the cover of the 1999 Cascade Utilities telephone book. The students had won a contest organized by the company that was open to those in grades four through six in the Estacada School District. Purdy, a sixth-grader, drew a space person with the words "Greetings. May I use your telephone and Cascade phone book? "; Youngberg, a fourth grader, drew a vibrating telephone on a table with a Cascade phone book next to it; Espinoza, a sixth-grader, drew a picture of a duck in a field holding a flower and a telephone; and Larson, a sixth-grader, drew a young woman's little brother asking her to get off the phone, with the young woman saying "Quiet, BJ!" The con-test received a total of 75 entries. Items included on the "Around Town" calendar 10 years ago included a meeting of the Estacada Toastmasters group, the Springwater Grange Strawberry Social and an adult volleyball group that met at River Mill Elementary School. With Ryan Carpenter selected as superintendent of the Estacada School District, Bill Blevins had been hired as principal of Estacada High School. Proir to coming to Estacada, Blevins served as principal at Sherman County School in the north-central Oregon town of Moro, where he also coached football and boys' basketball. "Interacting with students is the most enjoyable part of my day," he said. "Even as an administrator, I've made a point to coach and teach classes. It keeps you grounded."